Thistle Lodges016974 76254work Self-cateringWhether just for two of you to discover this unspoilt part of Scotland, or for a memorable family holiday by the sea, or as a base for group activity such as mountain biking, golf or coastal and forest walking. Thistle Lodges are an ideal destination. The three lodges are part of Barend, a well kept development of similar properties set back from the beach at Sandyhills Bay. Traditional constructed to a high Scandinavian standard, they have lovely views over wooded fells and a small loch. Free access to the onsite indoor swimming pool and sauna is included. Owned by the proprietors of the multi award winning Monkhouse Hill Cottages in Cumbria, the lodges are well equipped and furnished to a high 3 star standard. On the ground floor is a large living and dining area for 8 people, with a fully equipped kitchen adjacent with dishwasher and a washer/dryer. A large balcony with furniture for dining 'al fresco' is accessed through sliding doors from the living area. Also downstairs is a double bedroom and main bathroom with over bath shower. On the first floor is another double bedroom with an en-suite WC and wash basin. Also upstairs is a large open plan sleeping area with four single beds and a small balcony. 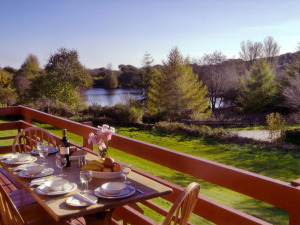 Thistle Lodges offers weekly bookings starting on Friday and sometimes short breaks.